Hard work. Peeling sour green tamarinds to make sweet and sour Tết preserves. My sister-in-law and I have already spent a couple of hours on this, and we still have hours to go. When tamarinds are ripe, the shells separate from the fruits and come off easily, but when they are green, we have to pick them off, bits at a time, with the tip of a knife. The biggest challenge is to avoid cutting through the four long fibers that run the length of each pod, or cutting nicks in the fruit, either of which would make the finished product less pleasing to the eye. We still have to remove the seeds, another challenge, because the fruits are firm and easy to break, like pieces of a hard apple. The brown pods on the left are soaking in water to make them just a little easier to work with, and the peeled ones on the right are soaking in salt water. Later, my mother-in-law will show us both the right proportions of vinegar and sugar to add to the seeded fruits, and then we’ll leave them to pickle for a week to ten days. In the meantime, we’ll be making all kinds of other Tết preserves, including sweet and sour vả (a type of local fig), and of course dưa món, assorted dried vegetables in slightly sweet fish sauce, which we eat with the Tết sticky rice cakes. 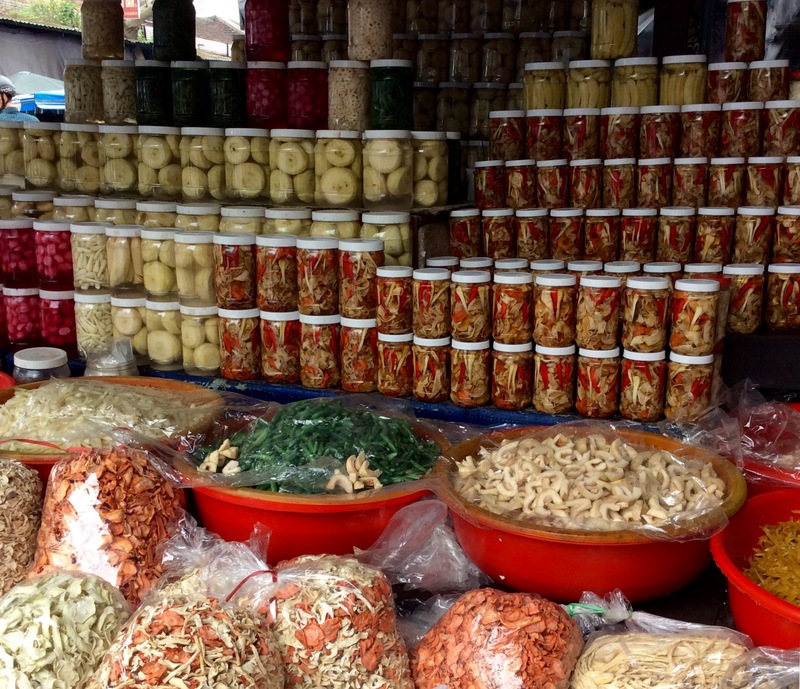 In the photo below, the white round shapes in jars on the left are vả figs, the long white shapes in jars at the top right are tamarinds. 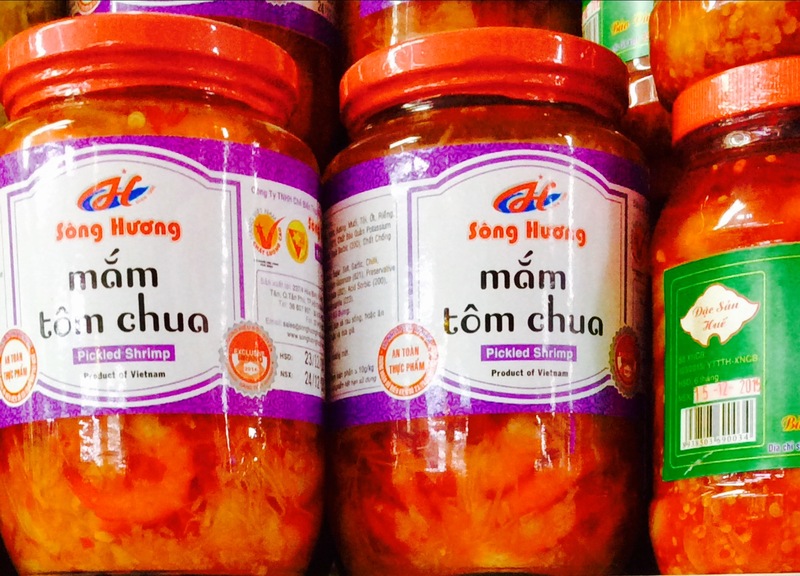 The mixture of multicoloured vegetables in jars is the finished dưa món. Below are the dried vegetables for making dưa món at home for people who don’t have time to cut and dry their own carrots, spring onion bulbs, garlic, chilis and other vegetables according to taste that go into this preserve. I’m not too crazy about the tamarind preserve because it’s bland and more sweet than sour. My sister-in-law feels the same and says she prefers it with chilis added, so that it’s spicy, sweet and sour at once. We have decided to suggest this to our mother-in-law tonight. Hopefully, she will agree. The cuisine of Việt Nam’s old imperial city of Huế features a number of local specialties that aren’t so well known in the rest of the country. The lightly fermented shrimp condiment called tôm chua, sour shrimp, is one of these. My in-laws tell stories of visitors from Sai Gon eyeing the plump pink shrimp in reddish sauce, wondering what main dishes it goes with and how to eat it. Although the shrimp are fermented, they look so fresh you’d think they’d been caught moments before making their appearance on the serving tray. My mother-in-law says the best tôm chua is prepared with shrimp grown in the brackish water of the Cầu Hai lagoon, about an hour outside Huế by motorbike. She says the carefully chosen shrimp are rinsed, their heads removed, and they are left briefly to marinate in rice wine, then transferred to a strainer to dry off. In the next step, they are combined with the necessary flavourings: thinly sliced garlic, shredded galangal and fresh bamboo, red chilis cut in thin lengthwise strips, sticky rice, and fish sauce. Amongst all the flavourings, galangal and chilis are the ones that give the tôm chua its characteristic flavour. The ingredients are placed in a ceramic jar to ferment for seven to ten days in a cool place, preferably where the temperature can be kept steady. Some people even keep the jars buried to maintain the ideal cool atmosphere for the shrimp to ferment. The steadier the temperature, the tastier and more fragrant the final product. The fermentation turns the shrimp a reddish colour, as if they’d been cooked, the same way lemon juice or vinegar will “cook” fish. At this point, the cook will add honey and maybe more galangal for extra flavour. Now, the shrimp are ready to bottle in clear jars that show off the lovely colours: pink or orange shrimp in red sauce dotted with yellow bamboo shreds, ruby red chilis and white garlic nubs. My mother-in-law says the condiment offers the perfect yin-yang balance, and all the important flavours: sweet, sour, bitter, and bùi (best translated as richness), linger on the palate. Tôm chua is most typically served as a side dish with boiled pork sliced thin and arranged in overlapping concentric circles, and sautéed bean sprouts or boiled rau muống (water spinach). Alongside these, finely sliced local vả figs, a type of astringent green banana called chuối chát, and sour unripe starfruit top a pile of herbs including basil and coriander, and of course, more red chilis. The result is an eye- and palate-pleasing feast fit for the Nguyễn kings who once ruled Việt Nam (in some cases as puppets) from the old imperial city of Huế. It’s mãng cầu seaon in Huế right now. I spotted these ones next to a pile of bright pink dragon fruit at the market. My mother-in-law knows how much I like to eat them, and often buys them in threes just for me. She tells me to hide them before someone else eats them up. This fruit, Annona squamosa, called sweetsop or custard apple in English, originated in the West Indies and tropical Americas. An old Mexican name, ate, is still reflected in the fruit’s name in several Asian languages, while in others, the common name obviously finds its roots in the Latin genus name. In northern Việt Nam, mãng cầu is called”na”, possibly from the genus name Annona. Another species of Annona, A. muricata, is called mãng cầu xiêm, and friends have explained that the word xiêm comes from Xiêm La, meaning Siam. Its English name is soursop. The flesh is similar, but there are many more of the hard shiny black seeds to spit out, and the fruit is juicier and messier to eat. Put together, the words form the phrase “cầu vừa đủ xài” – “We pray for just enough to use”. I am delighted to announce that my essay Bombshell is one of five shortlisted nonfiction entries in Briarpatch Magazine‘s fifth annual Writing in the Margins contest. Today’s exciting news brings balance for an email I received yesterday, my first rejection letter of 2016. I sighed and resolved to send the story in question out again. It’s all part of the writing life. Congratulations to the other nine shortlisted writers and poets. A big congrats, too, to Iryn Tushabe, winner of the Best Entry from Regina category. (Briarpatch is based in Regina, Saskatchewan.) Iryn’s story, Gone, will be published online soon. Judges Leanne Betasamosake Simpson (creative non-fiction) and Stephen Collils (poetry) have chosen a winner and a runner-up in each category. The winning pieces will appear in Briarpatch‘s March / April issue, and runners-up will be posted on their website in the next few weeks. 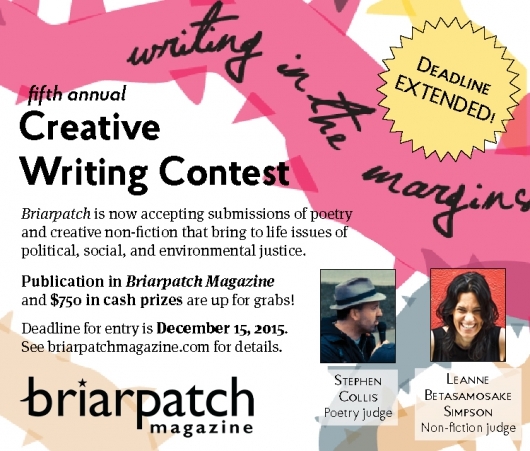 Read more about Briarpatch on their website, or pick up a copy. Or both. If you like to read about political, cultural, environmental, and social justice issues, you won’t be disappointed. The Word Every Writer Wants to Hear: Winner! I am pleased to announce that my food/travel essay Discovering Hến Rice in Central Việt Nam has won the Readers’ Choice Award in the I Must Be Off! 2015 Travel Essay Contest. It also shares third place with two other Highly Commended entries. Competition was strong, with over three hundred entries from forty-three countries. A big congratulations to Joel Hindson for his winning essay A Leaf on the Wind, and to second place winner Gabriella Brand for her essay Burning My Boots in Cabo Fisterra. Joining me in third place, the Highly Commended category, are Gillian Brown with her essay Crossing the Gibb and David Joseph with Sweet Homes. Well done, writers! My thanks goes to the host of this annual contest, prize-winning author and travel blogger Christopher Allen, and to this year’s judge, travel writer and blogger Catherine Sweeney. Thanks, too, to everyone who read, shared and commented on my essay. I couldn’t have won the award without you. If you are a travel writer, do mark next spring in your calendar; that’s when Chris Allen announces that this contest is open for submissions. 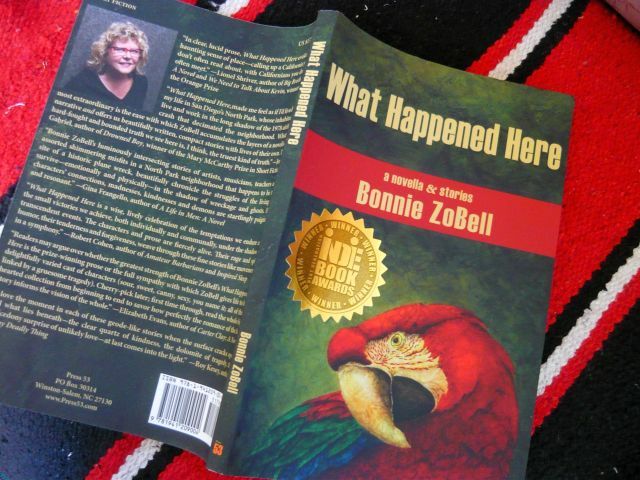 Bonnie ZoBell’s debut collection, What Happened Here, is a linked set of ten short stories and a novella. They share a neighbourhood, a history, and the glorious macaws that flit through the book. On September 25, 1978, PSA Flight 182 collided with a private Cessna and crashed in San Diego’s North Park neighborhood, killing all 137 people on board and seven people on the ground. In What Happened Here, this real-life disaster haunts the fictitious people who live on the block where Flight 182 crashed. The book opens with the eponymous novella, which introduces the characters. This is a group of everyday working- and middle-class people, some who lived there when the disaster happened, some who are recent arrivals, most of them haunted in some way by the neighbourhood’s history. The novella revolves around a memorial thirty years after the event, and is narrated by Lenora, whose husband John plummets into depression as the anniversary approaches. The neighbours struggle and cope with everyday issues and bigger psychological ones. The newcomers too, living in homes or on land where debris and bodies landed, are affected by the events that took place three decades before. All seem haunted by the spirits of those who lost their lives. I found the novella to be a bit long, dwelling heavily on the aftermath of the crash, mentioning specific horrors many times—but then in real life, such events never go away for the people who lived through them. Instead, they play again and again on the inner movie screen of each survivor or witness. Deep psychological trauma lingers decades after a disaster. Through this realistic device, ZoBell draws the reader into the lives of her characters. Not all the pieces deal directly with the crash. Rather they centre on the individual stories of the protagonists. Each of the stories struck me in a different way. Some I connected with more than others. Many of them are dark, the characters dealing with depression or bipolar disorder, like John in the novella. In Movement in the Wire—a sketch of a man still fighting the Viet Cong in his mind, and Rocks—about a woman who has escaped her abusive husband, (or has she? ), characters deal with PTSD. In A Black Sea, Alexa is in the throes of a relationship crisis. This story features escape as a theme. It also delves into magical realism, involving a chupacabra sighting. Yet this is not out of place in this otherwise realistic book; the wildness of the chupacabra both illustrates and encourages Alexa’s desire for freedom. Sea Life, too, revolves around escape. When the main character, Sean, slips into a deep transcendental state, ZoBell paints both the seascape and the experience so well that the reader wants to be there with him. Another tale about escape, Uncle Rempt was nominated for the 2010 storySouth Million Writers Award. A gentle humour, including some lovely, well-chosen metaphors temper the dark legacy of the crash and the inner struggles of the North Park neighbours. In Nimbus Cumulus, one character has “a smile as long as the highway out of a dry town in Utah,” and in Uncle Rempt, the narrator’s uptight father has a bald spot that “looked like jail bars, black rows of hair across white skin.” In Sea Life, an incident in the water amongst local seasoned surfers left me both smiling and imagining myself in the same predicament. I enjoyed this collection, and was interested to learn about the historic event, which I barely remember from the news thirty-seven years ago. I was too far away, in a different country, for it to affect my life. Zobell’s raw, unforgettable North Park characters and their stories, though fictitious, drew me to the internet to search for information. While reading about the accident and about North Park, I found myself recognising details from ZoBell’s meticulous rendering of the factual aspects of What Happened Here, details she has seamlessly woven into her book. I live only a half a block away from where it occurred. I also lived in North Park 30 years ago when it happened, but in an apartment further away. When it happens that close to you, it definitely has a lasting effect, as anyone who’s been through a catastrophe of this magnitude can tell you. It’s personal. It’s abundantly clear forever afterward that something can fall out of the sky at any minute and take away people you love and care about; that part of your neighborhood can disappear in an instant. What Happened Here has won 1st place in Next Generation’s Indie Book Awards in the novella category. You can buy the book on the Press 53 website. 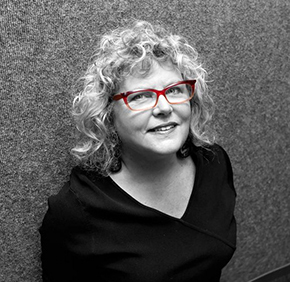 Bonnie ZoBell teaches at San Diego Mesa College, and is working on a novel. Her chapbook, The Whack-Job Girls, was published by Monkey Puzzle Press in March of 2013. Visit her website, www.bonniezobell.com, where you can find links to her other publications, her blog, and more. “North Park Eclectic” is a short documentary inspired by What Happened Here. Directed by Melanie Peters, produced by Melanie Peters and Bonnie ZoBell. Includes brief interviews with residents and footage taken after the crash. Eating hến rice at home in Huế. Feeling quite chuffed that my short essay about a lesser known specialty dish from Việt Nam (called cơm hến, clam rice) has been shortlisted for the Third Annual I Must Be Off! Travel Essay Contest. The essay, Discovering Hến Rice in Central Việt Nam, is now posted at I Must Be Off! together with three photos I took in Huế. (Wish I had some better photographs of this multifaceted dish.) Many thanks to contest host and organiser Christopher Allen and to this year’s judge, Catherine Sweeney. All winners and honourable mentions will be announced on September 30. 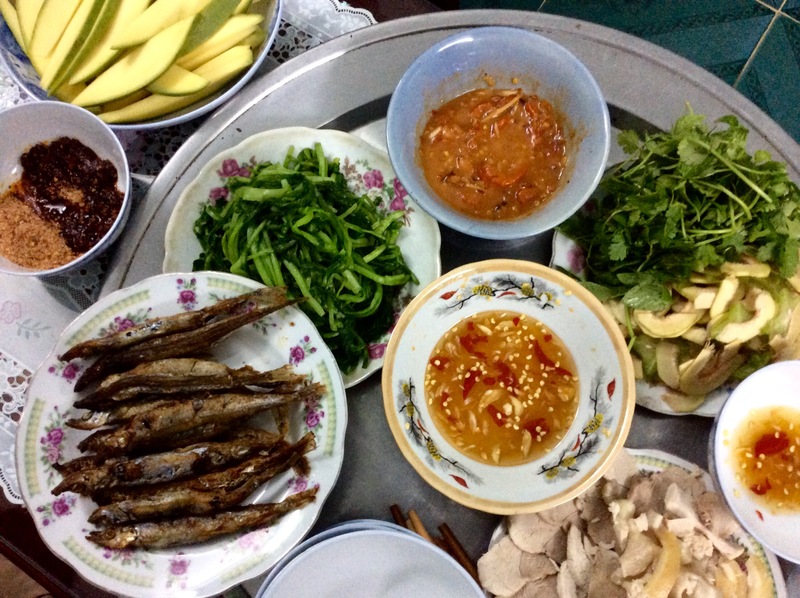 Travel Essay “Discovering Hến Rice in Central Việt Nam” Shortlisted! I’m thrilled to have my essay Discovering Hến Rice in Central Việt Nam shortlisted for the Third Annual I Must Be Off! Travel Writing Contest. Writer, traveller, and I Must Be Off! blogger Christopher Allen unveiled the longlist on July 27, but revealed the titles without authors’ names because judge Catherine Sweeney was still choosing the finalists and winners. I was excited to find my essay on the list, and to learn that the semifinalists were chosen from over three hundred entries from 43 countries. It was tough keeping the news quiet, as requested by the contest organisers. And then my essay made it into the finalists! Woohoo! The shortlisted essays will be published at I Must Be Off! During the month of August. The 1st, 2nd and 3rd place winners will be revealed on September 30. 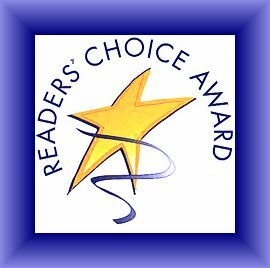 One essay will win a Readers’ Choice Award, based on hits and comments. My essay will be published on the site on Aug 14. I’ll post the link when it’s up. Thanks, Chris and Catherine, for moving my essay into the final ten, and congratulations to my fellow finalists. It’s great to be in your fine company. Best of luck to you all! 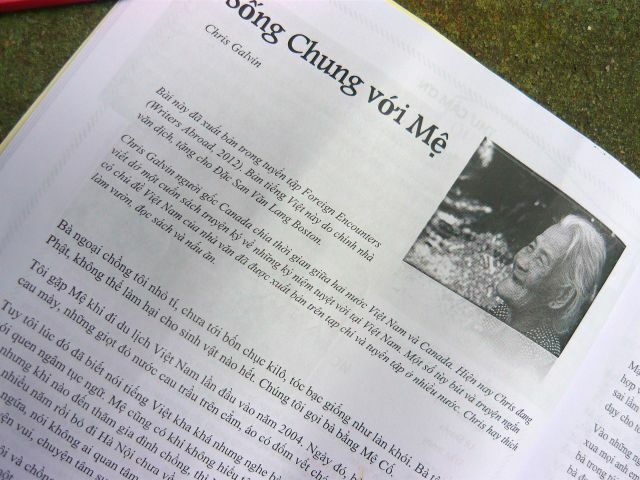 I’m pleased to announce the publication of Sống Chung với Mệ in the 2015 issue of Đặc San Văn Lang Boston. This piece is my translation to Vietnamese of my essay Life with Mệ, which appeared in the 2012 Writers Abroad anthology, Foreign Encounters. Life with Mệ, a piece from the collection I’m currently working on, is a reflection on living with my Vietnamese Grandmother-in-law in Huế, in Central Việt Nam. (That’s not her image in the magazine; the editors chose a stock photo.) Earlier this year, I had the pleasure of sharing this story with a small crowd at the opening ceremonies for the Pointe Claire Public Library’s 50th anniversary celebration. Mệ (Grandmother) told me she feels a little embarrassed but pleased to know that so many people have read about her. Đặc San Văn Lang Boston is a special issue celebrating the seventeenth year of the Văn Lang Boston Vietnamese Language Center (Trung Tâm Việt Ngữ Văn Lang Boston). The volunteer teachers at the centre offer language programs with the goal of preserving the Vietnamese language and culture for Vietnamese American children in the Boston area. My thanks goes to the director of Văn Lang Boston for the invitation to contribute an essay to this special issue, and to the previous one (2012) as well. It is an honour to do so. Thanks, Hiếu! Another one, about vegetables, appears in the Tiny Truths section of issue #55, the Memoir Issue (Spring 2015). You might like to hurry over and grab one of the last few copies of this special double issue before they sell out. Also in the #cnftweet department, Vivian Wagner’s latest article for Easy Street Magazine features an old one of mine that appeared in Creative Nonfiction’s The Human Face of Sustainability issue (Spring 2014). Vivian has also quoted a #cnftweet by Anika Fardjo, whose micro-essays consistently please me. Have a look at Vivian’s article, Short-Short-Short Stories: A Look at the #cnftweet World. 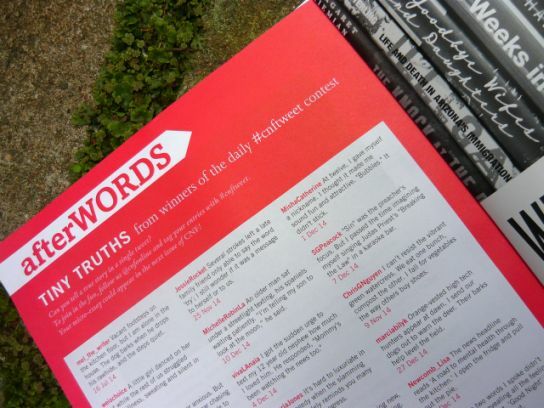 If you can tell a true story well in 140 characters, tag it #cnftweet to enter Creative Nonfiction Magazine’s daily micro-essay Twitter contest. If the @cnfonline folks like it, they’ll favourite and retweet it, and maybe even publish it in the newsletter or magazine. Note that the character limit includes the tag. In older news, I was quite chuffed when Slow Writing, a craft essay I wrote for QWF Writes, was a WordPress editors’ pick featured on Freshly Pressed. The steady flow of readers and commenters, most of them writers at various stages in their careers, amazed me, and the comments were a pleasure to read. One person said “I almost feel like I just attended a support group for writers”. I took this to mean not only the essay but the many thoughtful, insightful comments too. The feedback from readers and other writers is one of the best parts of writing. 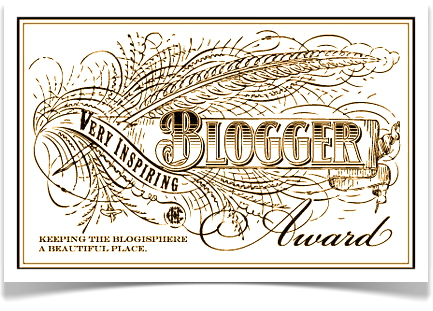 Thanks, QWF Writes, for nominating me for the “Very Inspiring Blogger” award. QWF Writes is the Quebec Writers’ Federation’s monthly online column. 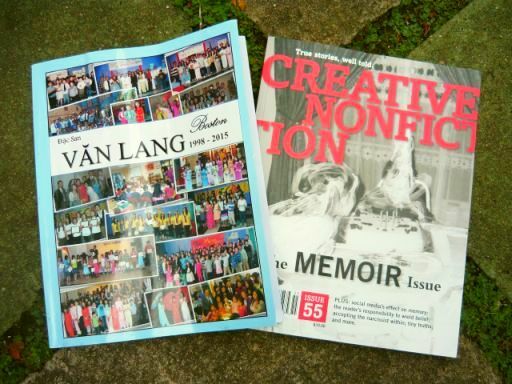 The QWF does a lot of great work promoting writing in the community. Have a look at their post (linked above, in the first line), to see a list of seven great ways they do this. The award is a promotional chain for bloggers, a pay-it-forward way of sharing websites bloggers admire. 1. Thank the person who nominated you and add their link to your blog. 5. Contact your nominees and provide a link to your post. 6. Display the award logo on your blog, whether on your sidebar or about page, or special award page. 1. I’m always grateful for these awards, and what I like most about them is nominating other bloggers. It’s always a challenge to choose just a few blogs from the many great ones out there. What I like least is listing seven things about myself. 2. I’ve been writing for a long time, but I only just this week joined a writers’ group. They are four women, all talented published writers who, like me, write nonfiction. I felt honoured when they invited me to join them. We met a few days ago to discuss and critique each other’s essays and chapters from WIPs. Each person brings a different strength to the critique table, and this promises to be a rewarding experience. 3. Mostly, I write nonfiction, especially about Việt Nam, food, and nature. I do write some short stories, and hope to eventually put a bunch of them together in a book. 4. My current project is a book of personal essays about living in Việt Nam. This may sound familiar, because I’ve been working on the same project for a very long time. A few years, in fact. When I first began, I had a different plan for the book’s setup and style. Then, I wasn’t sure what direction several of the essays should take. Most of them are ready now; eleven have appeared in various literary and travel magazines and anthologies, three are still in the final polishing stage and one of these may get broken into two separate but linked pieces. I’m almost ready for agent-hunting! 5. The book I’m reading now (and enjoying immensely) is Boundless (Anansi, Cape), Kathleen Winter’s travel memoir about her trip through the Northwest Passage. The Guardian has a great review, complete with a link to a video of Nathan Rogers performing his father’s song The Northwest Passage. 6. I sometimes write quickly, but usually, slowly, and then spend a long time editing, rereading, editing, polishing, letting it rest, polishing. . . I call it slow writing, and I mused about it in a recent QWF Writes column. 7. I’m relieved to reach the end of this list of facts about me, and will celebrate by making some bread, because I love baking. After that, it’s back to work on the book. 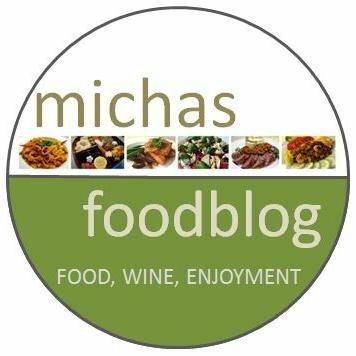 Michael Pokorra tries out wines and recipes and writes about them on his bilingual English/German food blog. (If you don’t read German, just scroll down because every single post has an English version.) He accompanies his posts with his own mouthwatering photographs of his beautiful presentations. I hope he collects his recipes in a book soon. Margrét is a Norwegian-Icelandic expat and writer who writes in English. 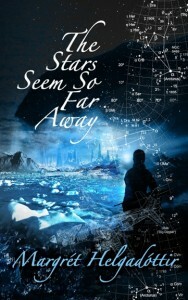 Her debut book, The Stars Seem so Far Away (Fox Spirit), is out on Feb. 13, 2015 . Margrét is the editor for one published and two forthcoming Fox Spirit anthologies. She is also a talented photographer, and here and there on her blog, you’ll find some real gems, from art photos to street and architecture photography. Michelle grew up in the American Midwest, while her husband grew up in Việt Nam. They met in college. 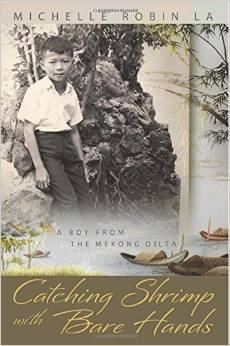 She writes about their culturally blended life together, and about her husband’s childhood years in the Mekong Valley. Michelle’s book Catching Shrimp with Bare Hands (ViewPort Publishing) just came out at the end of January. The book is a memoir of her husband’s childhood, as told to her by him.